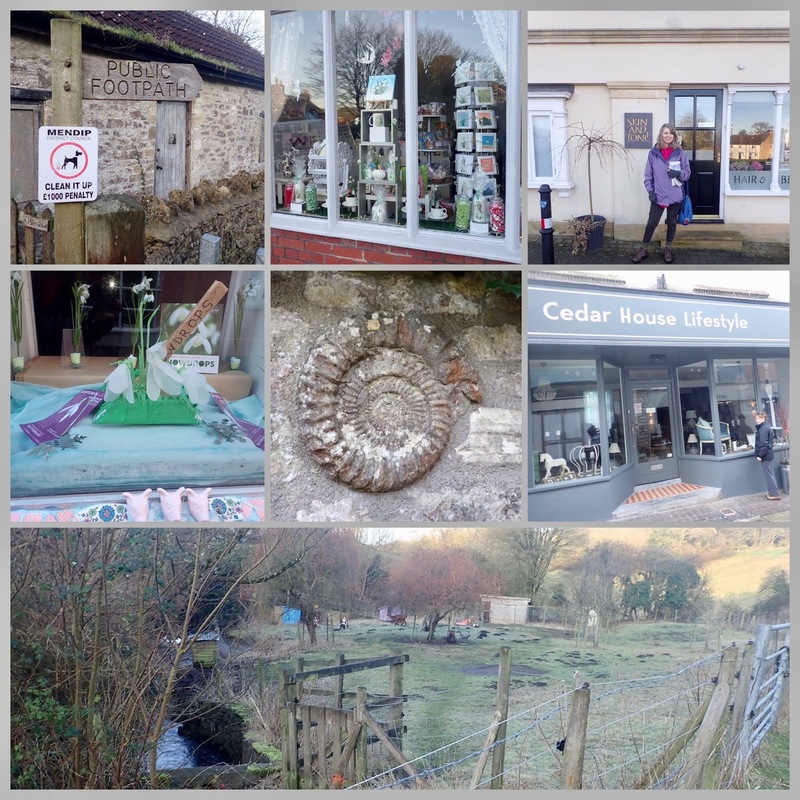 FROM PRIDDY TO WOOKEY HOLE! Today's walk was all about the views! Early this morning, Belinda and I drove to Priddy, and took the Wookey Hole road until we found a car park, with picnic area and footpaths. 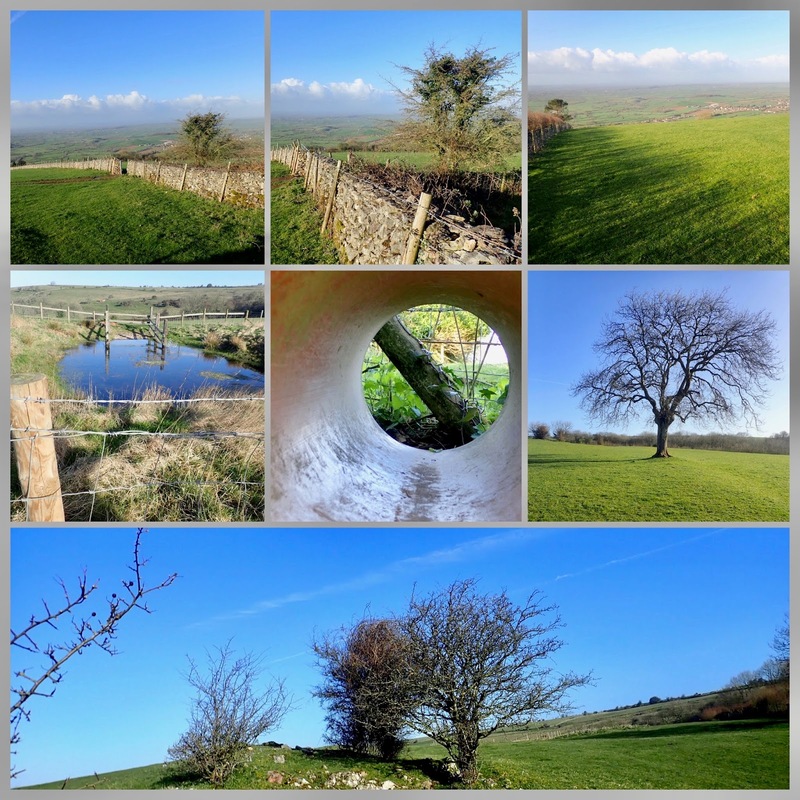 We were still high up on the Mendips so had fantastic vistas which were made even more special with blue sky and white fluffy clouds. We could see Glastonbury Tor and way beyond for miles. Belinda tried out some panoramic shots with her new phone! This morning I was looking for derelict farm buildings to take photographs of, as subject matter for an art course. 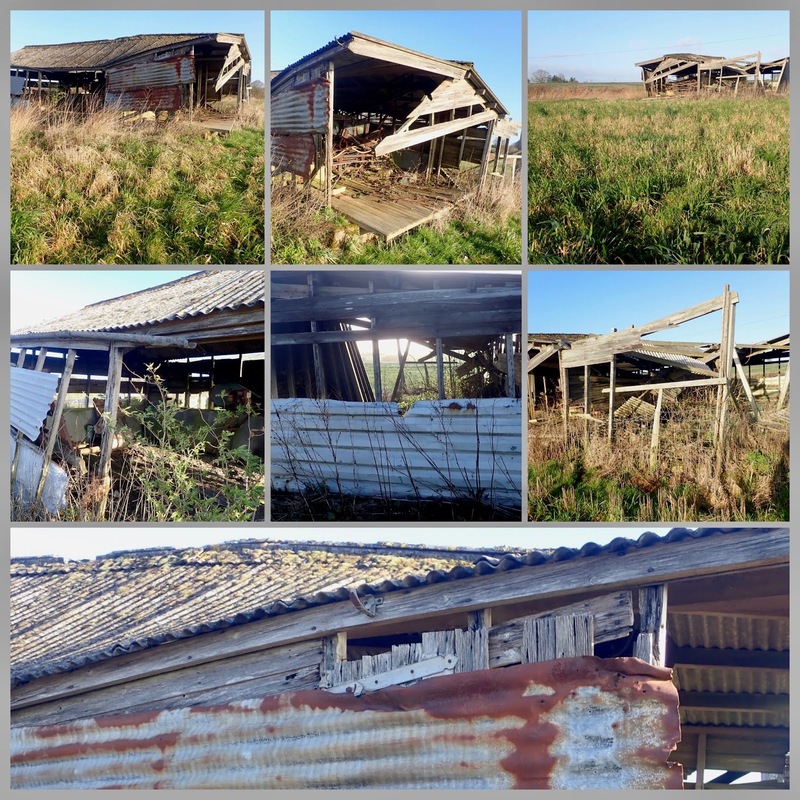 We spotted this building, shown above, just outside of Priddy and had to stop as it fitted the brief perfectly! 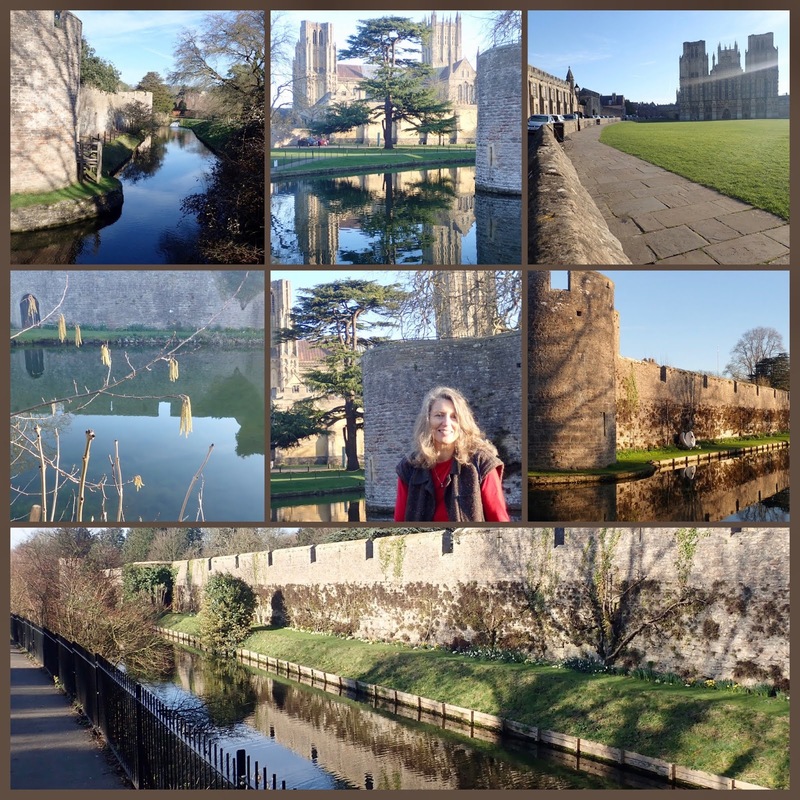 IT IS WORTH WALKING TO WELLS! 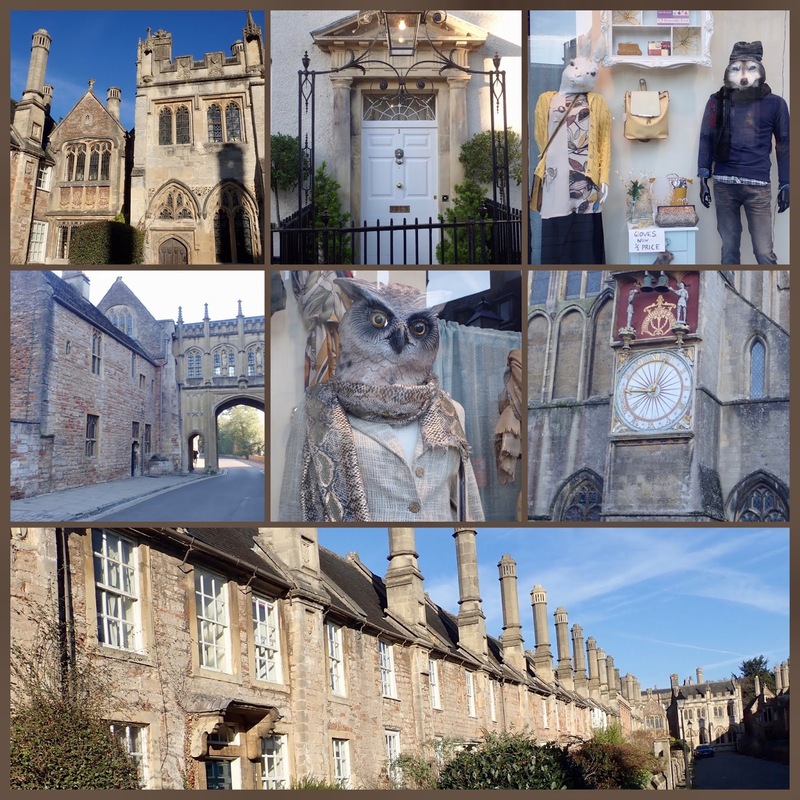 Wells is full of historic buildings, especially around the Cathedral and the Vicars' Close - which is claimed to be the oldest surviving residential street with original buildings in Europe - see bottom photograph. 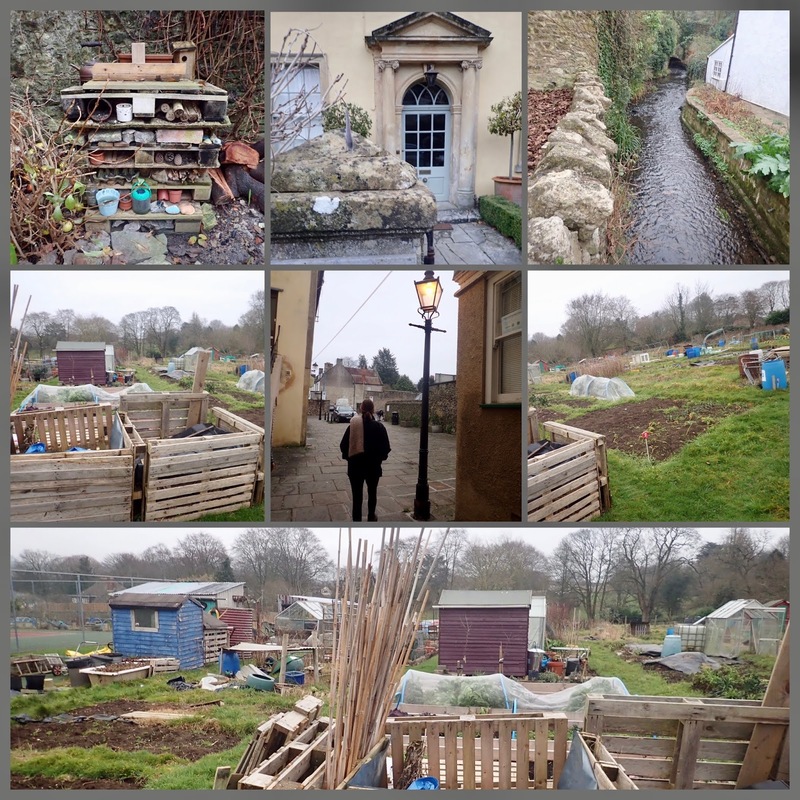 Today Belinda and I went for local walk and viewed the aftermath of the Snowdrop Festival, which took place at the weekend. Belinda said that Shepton had been buzzing! 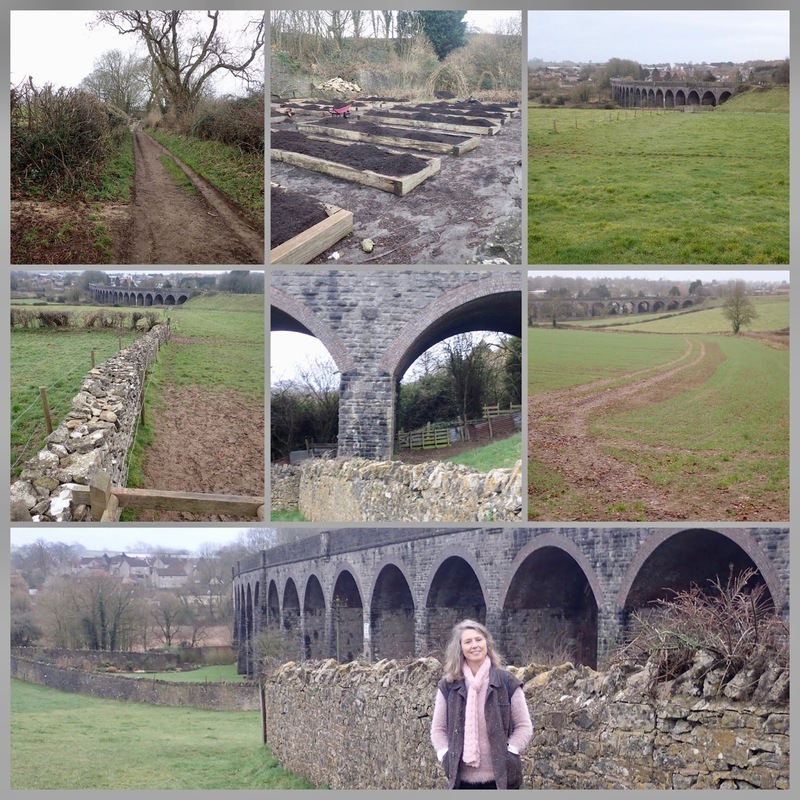 Our walk took us to the Charlton Viaduct, part of which is in the gardens of Kilver Court. Our route went by their vegetable garden which is being prepared for planting - see above centre top photograph. 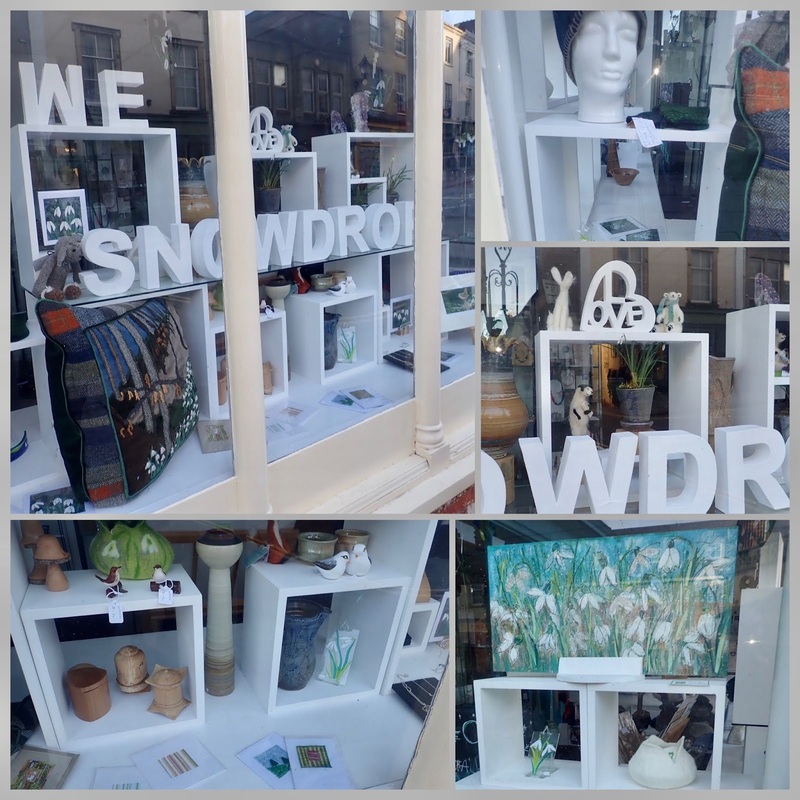 The snowdrop festival is run by Shepton Mallet Horticultural Society and they have implemented a massive planting programme, so wherever you go in and around the town, you can see the delicate white snowdrop heads. We saw them everywhere - they are a welcome sign of the forthcoming Spring! So much for good intentions! 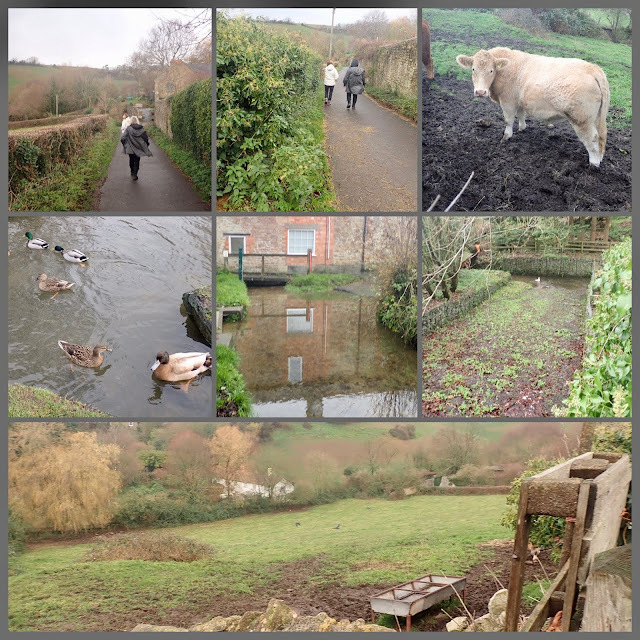 Belinda, Jenny and I have found that colds, work and life commitments have got in the way of the three of us going for a walk! 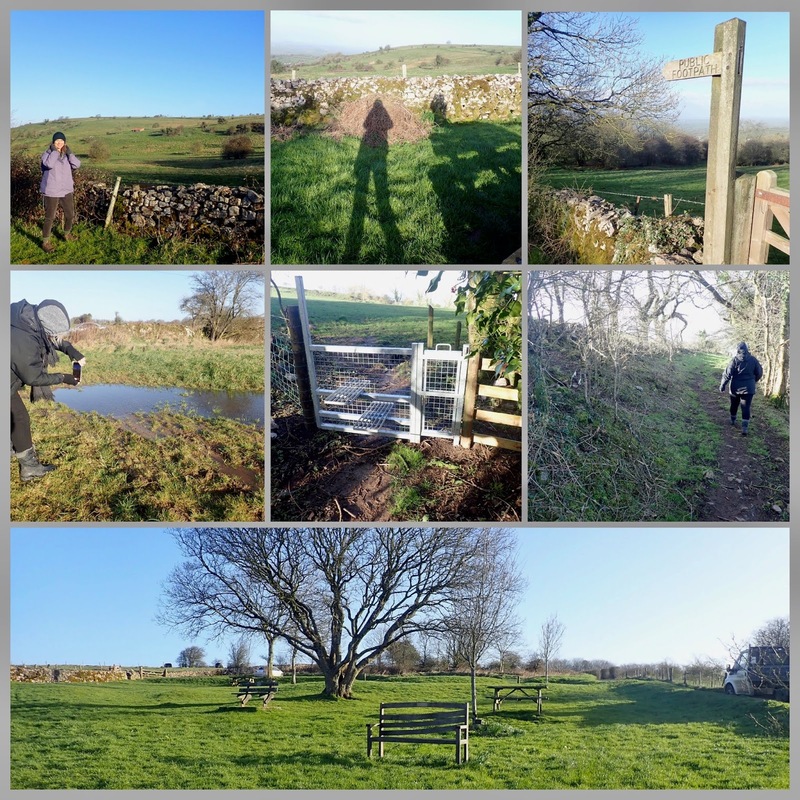 However, yesterday the sun shone and we managed to get together to have a look around Shepton and follow some public footpaths around the outskirts. 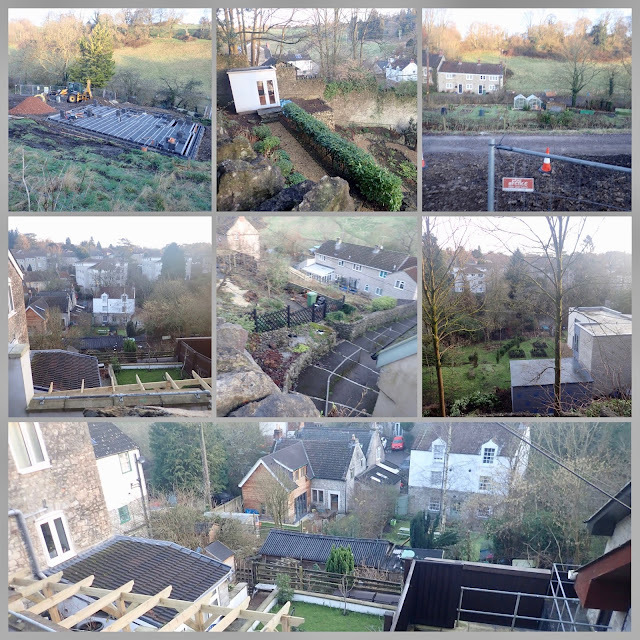 As Shepton is quite hilly, you get some interesting views, looking down into people's houses and gardens - see above. 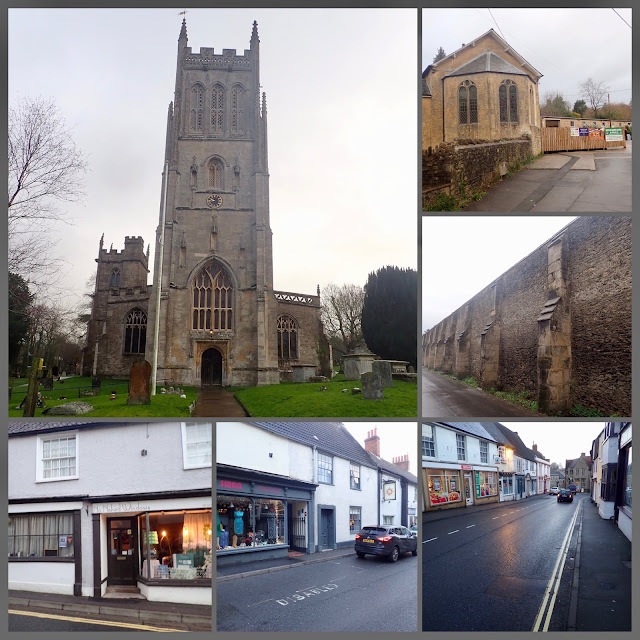 The town is starting to buzz in anticipation to the Shepton Snowdop Festival which takes place this coming weekend. At the One Craft Gallery, I had a hand in the window dressing (see above). 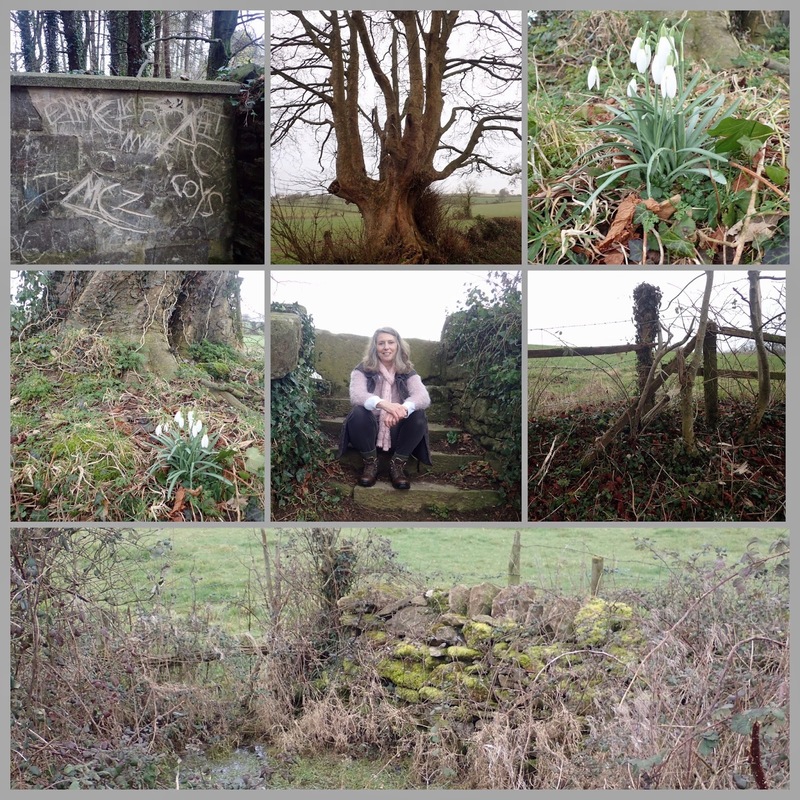 My painting, 'Dancing Snowdrops' can be seen in the bottom right photograph. 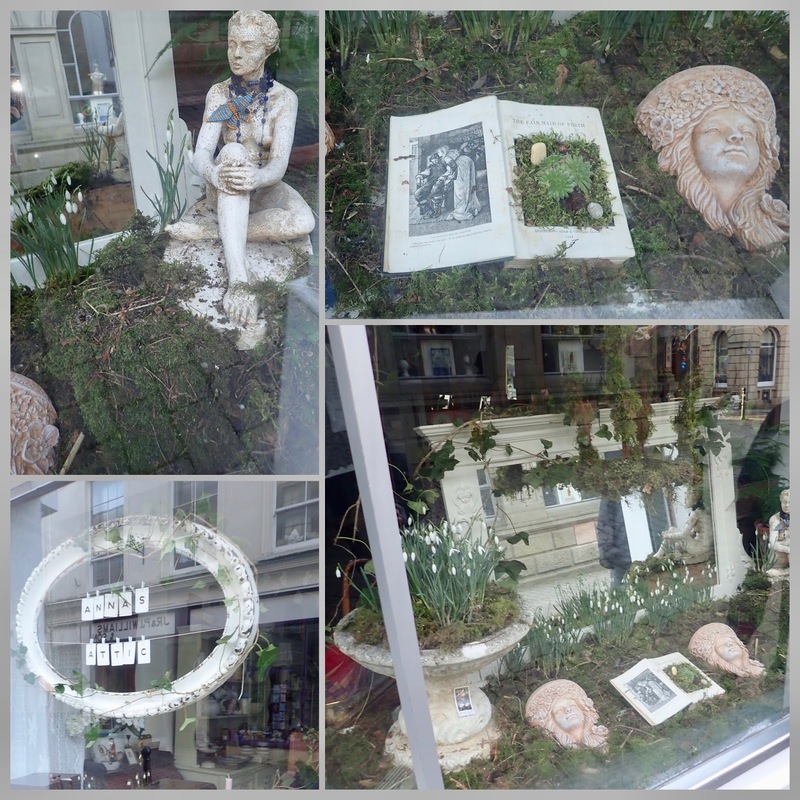 Above is the fabulous snowdrop window done by Anna for her shop, Anna's Attic. 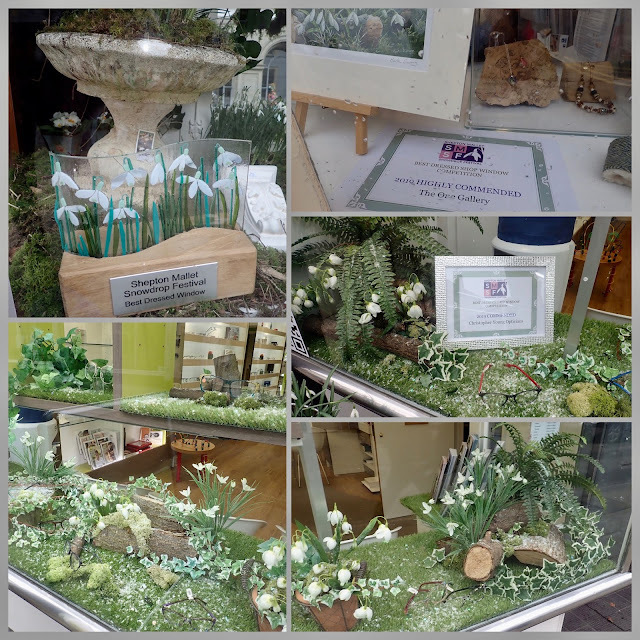 She won the best window design last year and it looks as though she is set to win again! 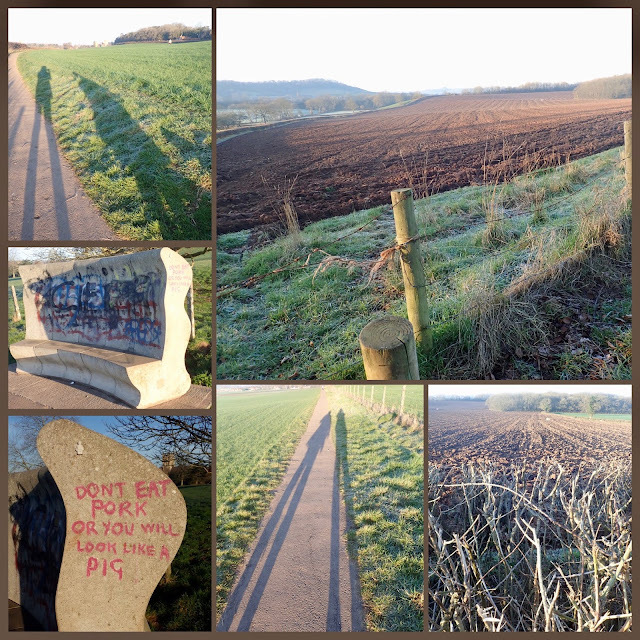 A NEW YEAR OF WALKING! 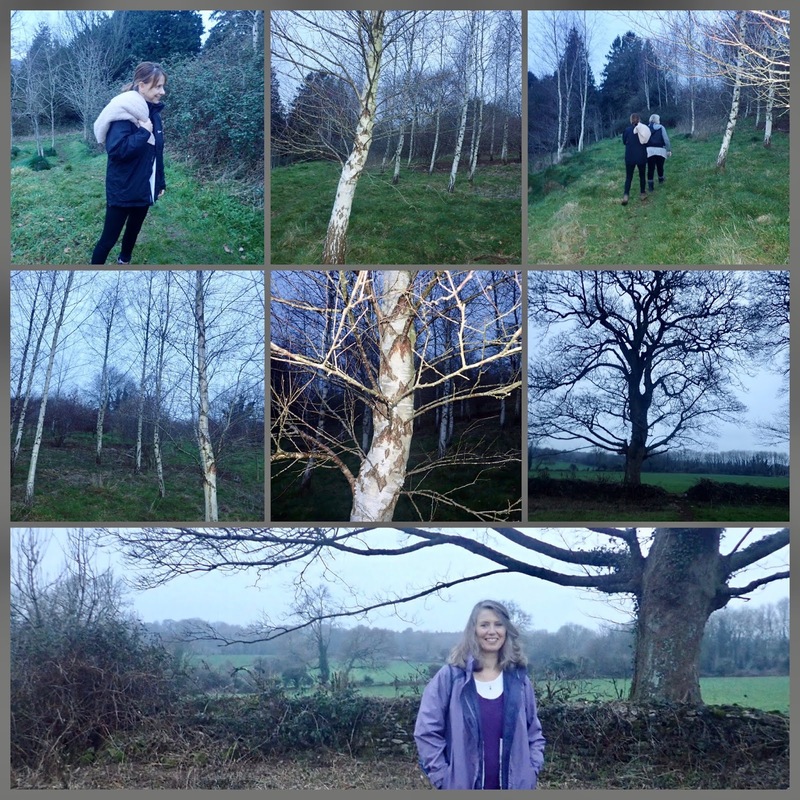 Today Belinda, Jenny and I managed to get together for a walk, the first of the New Year. 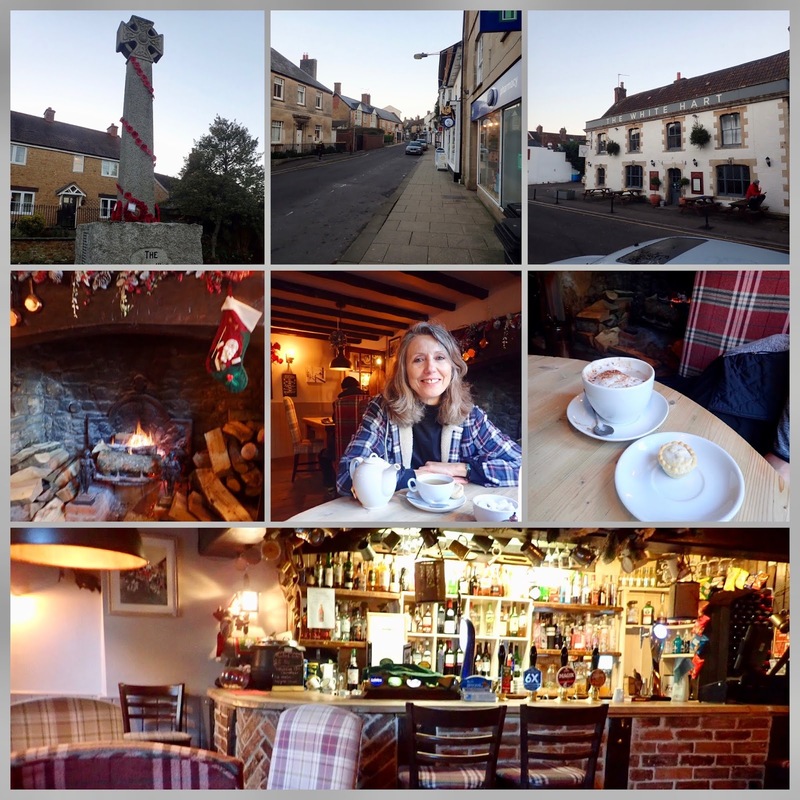 We were all busy in the run up to Christmas and Jenny went to America and I went to the Isle of Wight for the festivities. We all decided that we definitely needed to get fitter this year and do more exercise, so this was a start! 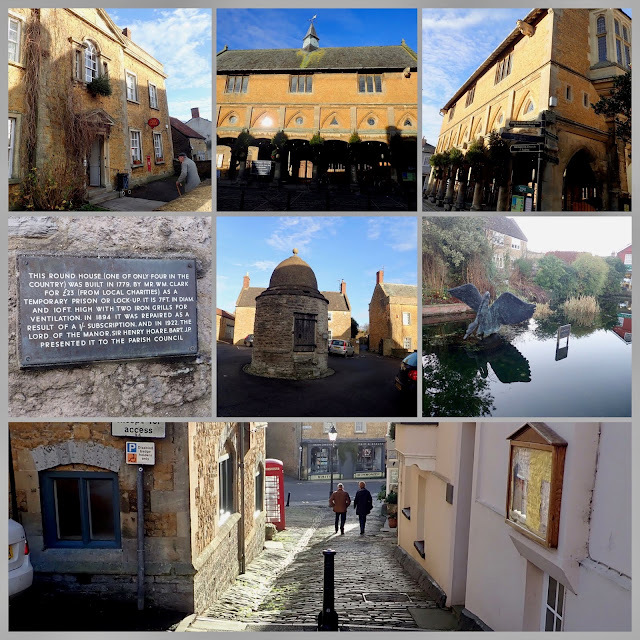 CASTLE CARY IS FULL OF GOLDEN STONE BUILDINGS! As part of our exploration we took refreshments in the old George Inn, sitting in the window by a roaring log fire - see above. 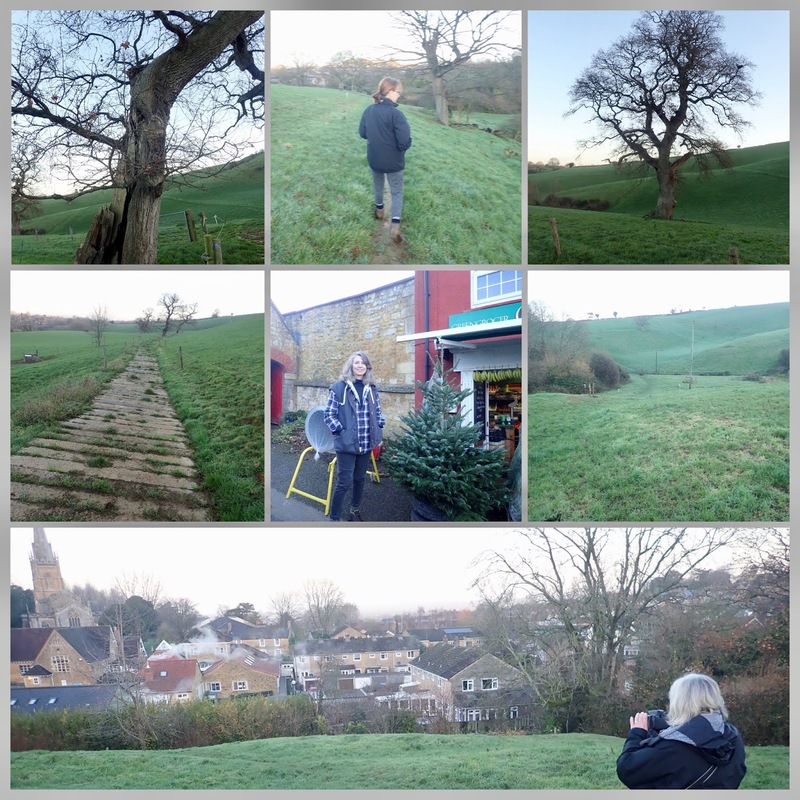 We did some window shopping in the High Street, admired the Christmas decorations, and then walked into the countryside beyond. The day started quite cold, dry and grey, but the sun came out and transformed the morning. In Shepton we are surrounded by great villages and towns that are worth looking at. 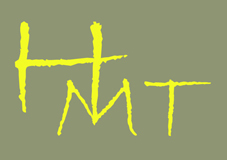 We are on a mission to seek them out! 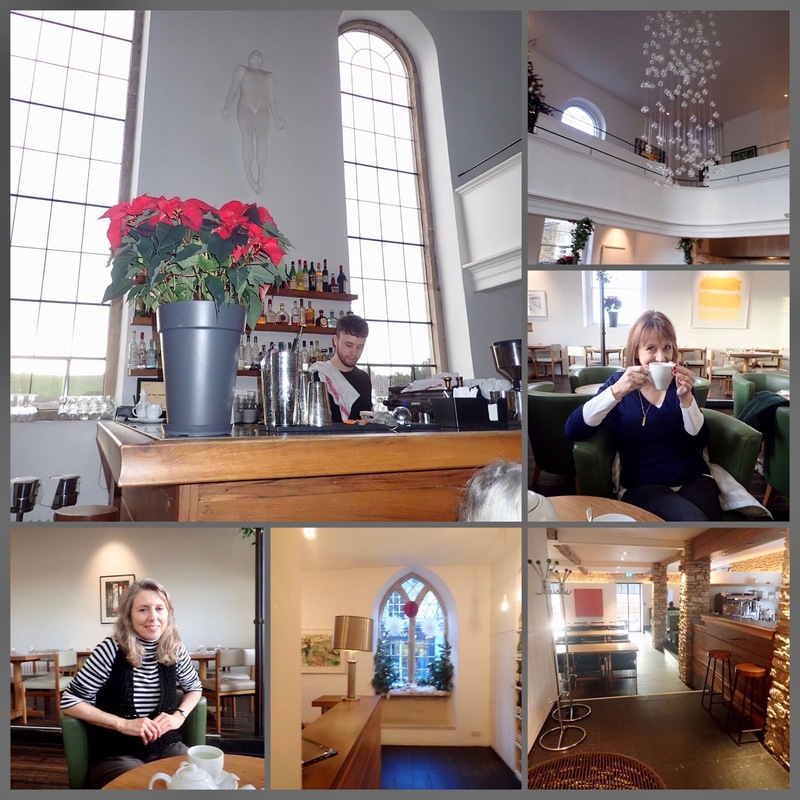 BRUTON IS A GREAT PLACE TO VISIT! In the last post we mentioned collecting branches to use as Christmas decorations. Well, below is an example! 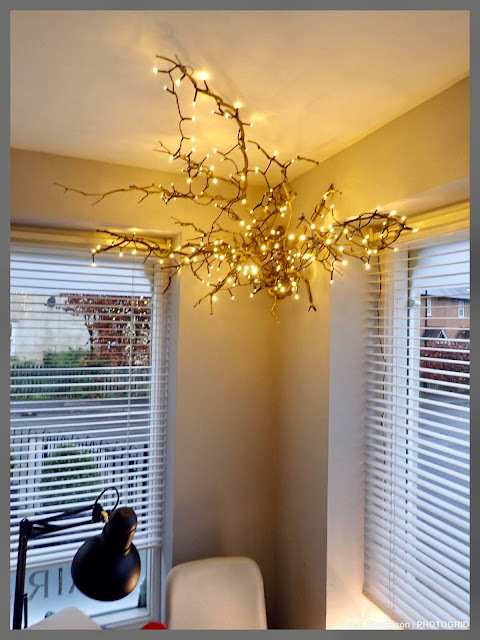 Jenny has used her branch by covering it in fairy lights and hanging it in the corner of her beauty salon reception. It looks beautiful! FESTIVAL SITE GOOD VENUE FOR A WALK! 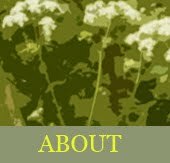 WE FIND GOG AND MAGOG!